Put the board in the middle of the table, so that all players can easily reach it. Place the die and the 6 Unreachable World tiles next to the board. Deal a God sheet to each player and put the ones you do not use away in the box. Place a number of Elves equal to the number of players +1 on the World of the Elves . Place the Vanir on the first square of the Reinforcement Scale in the Sacred Land . 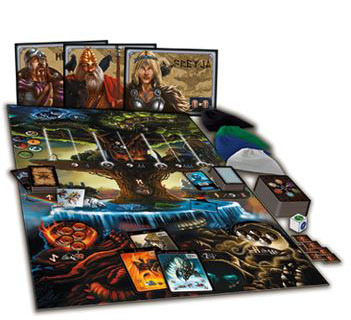 Place the 6 Enemies on their initial position in Asgard . Place the 18 Artifact cards on the Dwarven Forge . Shuffle and place the 16 Giant cards face down on the Ice Fortress . Place the Valkyries on the Rainbow Island in Midgard . Place the Submerged Island tile on the Black Island in Midgard . Place 12 Fire Giants on the Kingdom of Fire . Place 5 Vikings on the World of the Dead . Prepare the 42 Enemy cards deck corresponding to the difficulty you want. It is possible to vary the difficulty level of the game as you wish. The Angry Enemy cards make an Enemy move forward two spaces instead of one (if possible). The effect of the corresponding Enemy is applied only once, after his move. According to the difficulty level you choose, replace one to six Enemy cards with the appropriate Angry Enemy cards so that the deck still contains 42 cards. The Ragnarok cards make several Enemies move forward one space at the same time. The effect of the Enemies is not applied for these cards. When you want an even more difficult challenge, add one or several Ragnarok cards to the 42 Enemy cards. We advise you to distribute the Special cards equally in the deck. To do so, divide the deck in a number of piles equal to the number of Special cards you want to insert. Add the Special cards to the top of each pile, then shuffle each pile and re-form the deck. The number of players also has an influence on the difficulty level : the more the number of players is important, the more the game is difficult. 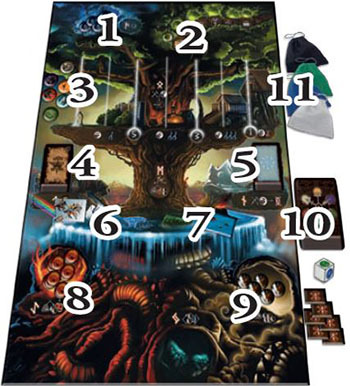 Yggdrasil is a co-operative game. Playing the role of a God, you must, with the other players, stop the advancing Evil Forces in Asgard. When an Enemy card is taken, its counter moves forward to the next space (on the right) in Asgard. Then the effect of the Enemy is applied. The active God performs three different actions among the nine at his disposal. Each action corresponds to one of the worlds of Yggdrasil. There are five Enemies or more beyond the wall of Asgard. There are three Enemies or more beyond the door of Valhalla. There is one Enemy in Odin's Residence. The Gods win the game if they run out of Enemy cards and none of the above conditions have taken place (after the active God has applied the effect of the last Enemy card and performed his actions). The night of the "Destiny of the Gods", the Gods will have to fight for the survival of the world tree. An arrow piercing the heart of the beloved God will announce the beginning of Ragnarok. For three long years, the terrible winter will rage. The wolves Hati and Skoll will catch and devour the Sun and the Moon. Fenrir will break his chains while Loki will escape from the torment. 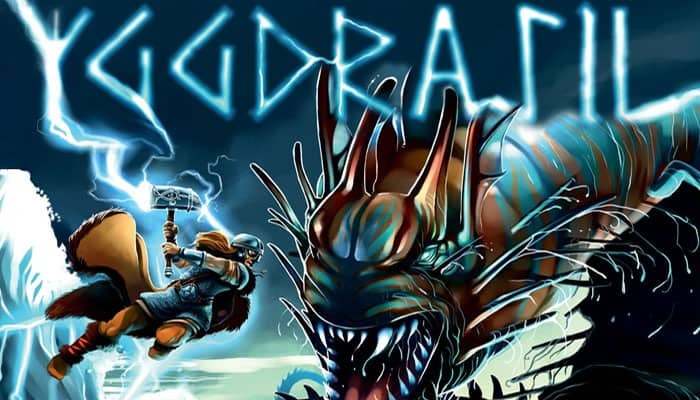 Jormungand will rise up above Midgard while Naglfar, the nave of nails, will get under way. So will the ultimate fight between the Gods and their Enemies begin. From the ashes of this cataclysm, Yggdrasil will rise.